Neither side appeared especially crisp through the opening minutes of the game, with no solid scoring chances either way or an edge in territorial play for either side. The Bulldogs were penalized five minutes into the game, and the Spruce Kings were dangerous on the power play, with John Hawthorne coming up with back to back instances of making several saves on scrambles on rebounds around his net. The Bulldogs succeeded in killing it off, but were unable to generate mch offensively. The Spruce Kings had an edge in the play as the period wore on, with Hawthorne tested often but looking razor sharp to keep it scoreless. 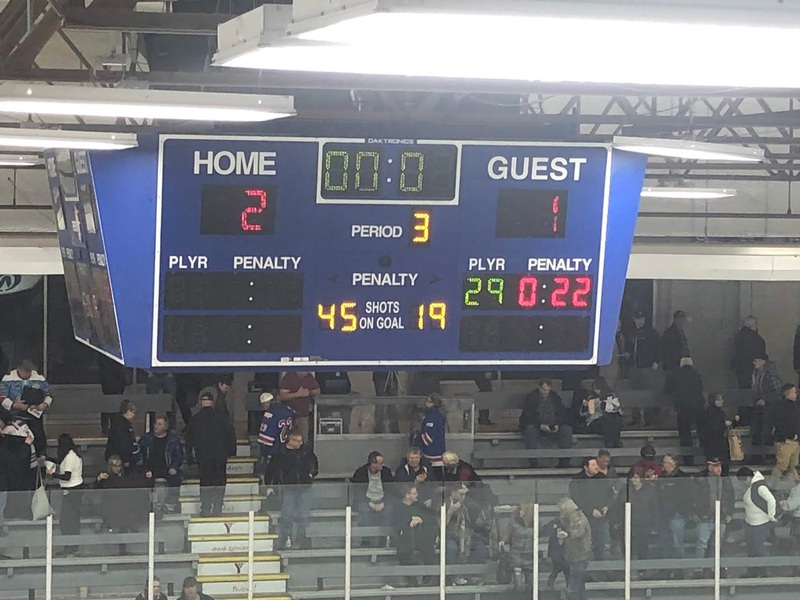 The Bulldogs pushed back later in the period, after winning a series of faceoffs after losing the bulk of them early in the game. Back to back shifts remained in the attacking zone, with Logan Neaton making a series of saves around his net to keep it scoreless. The Bulldogs got caught pushing offensively late in the period, resulting in a 5 on 2 rush for the Spruce Kings that saw the Bulldogs take a penalty at their net. The Spruce Kings would make it count, with Layton Ahac throwing a wrist shot on net from the left point that was deflected in front of Hawthorne by Corey Cunningham inside the near post, to make it 1-0 at 19:35 of the first with Nolan Welsh also assisting on the play. Shots in the first were 19-10 Spruce Kings. The second period didn't see much of an edge or chances gained by either side through the first ten minutes of it. 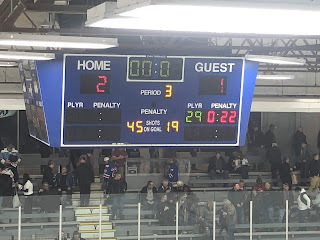 While the Bulldogs weren't giving up much, and the Spruce Kings were kept largely to the outside, they also weren't generating any chances of their own or a territorial push to change momentum. The same kind of game continued throughout the remainder of the period, with plenty of whistles and again neither side able to generate much in the way of offense or sustained pressure. Much like the first period, the Bulldogs scored to tie the game in the final half minute of the second as Keaton Mastrodonato knocked down a puck at the Bulldog line for Ryan Miotto. He would accelerate up the left wing over the Prince George line where he threw on the breaks and lost an edge, but the puck slid back perfectly onto the stick of Grayson Valente at the top of the left circle, where he one-timed it home top corner, far-side over the glove of Neaton for his first career goal, to make it 1-1 at 19:41 of the second. Shots in the period were 11-5 Spruce Kings, for a 30-15 edge after 40 minutes of play. The Spruce Kings took the lead back early in the third period, on a goal similar to their first one as Liam Watson Brawn walked from the right point down the right wall before throwing a shot at the net that was deflected through Hawthorne by Craig MacDonald at the top of the crease to make it 2-1. Chong Min Lee also drew an assist at 4:53 of the third. The Bulldogs weren't able to generate an offensive push throughout the period, with a big penalty kill to keep it a one-goal game. They would press late, and give up an odd-man rush that saw Hawthorne make a ridiculous highlight reel save on Nolan Welsh. Hawthorne would again keep the Dogs in it with just over two minutes to play, robbing Ben Brar on the doorstep not once but twice on the goal line to keep it a one goal game. The Bulldogs got Hawthorne out for the extra attacker with just under two minutes to play and had a good shift going in the attacking zone but unfortunately took a penalty. They managed to kill it off to the point where they got Hawthorne out to make it an even strength situation with 30 seconds to play. Mitchel Deelstra would drive the net and make a man miss before getting it on goal, but Neaton in desperation kept the rebound out as time expired. Shots in the third were 15-4 Spruce Kings, for a game total of 45-19 in their favour, with Logan Neaton picking up the win while John Hawthorne earned 2nd star honours with the loss. The Spruce Kings went 1 for 5 on the power play. The Bulldogs didn't earn a power play opportunity. The Bulldogs are in Merritt tomorrow night, for a 7:00 puck drop against the Centennials.